A number of Iranian animated films have been screened for children in Dallas, the United States, as part of a festival dedicated to Persian movies. The event was organized by ‘Sheed Film’ company and was performed in collaboration with the French DreamLab Company and Iran’s Institute for the Intellectual Development of Children and Young Adults, according to a Farsi report by Asr-e Iran news website. At the event, which was held for one evening, animations made by Iranian directors were screened free-of-charge for the audience with the motto ‘Finding a Friend like Me’. This was the first time that such an event was held for Iranian children in the United States, and it is said that ‘Sheed Film’ wanted to evoke sympathy and develop friendship among Iranian kids and help them get acquainted with each other. It was also aimed at inviting children from other countries to watch Iranian animations. 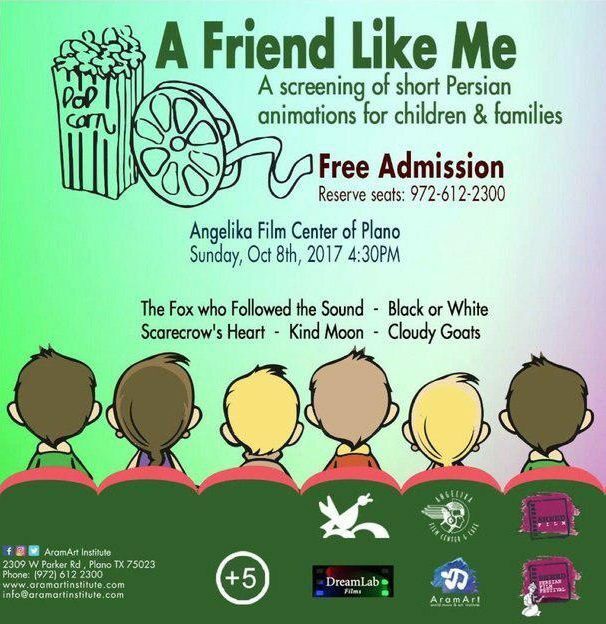 The show kicked off on Sunday, October 8, in Angelika Film Centre Plano, Dallas. Films like “The Fox Who Went after the Sound” directed by Fatemeh Goodarzi, “Black or White” directed by Mohammad Ali Soleimanzadeh, “Scarecrow’s Heart” directed by Gholam-Reza Kazzazi, “Cloud Goats” directed by Hamid Karimian, and “The Kind Moon” directed by Nazanin Sobhan Sarbandi were screened at the event. The ‘Sheed Film’ authorities have announced that they sought to support all Iranian and world-known Persian-language films by selecting valuable works in order to make the foreigners familiar with the culture and art of Iran and Persian-speaking people, and also maintain the relations and links between Iranians abroad, especially the younger generation.